It's better than we or the market expected - and we will have to revise our full year 2019 GDP growth to 2.2% from 1.9%. But government spending leads the way, so sustainability remains a key question. At 3.1%YoY, 4Q18 South Korean growth looks like a cause for celebration. It was well above the 2.7% consensus view and our own much more bearish 2.1% forecast. 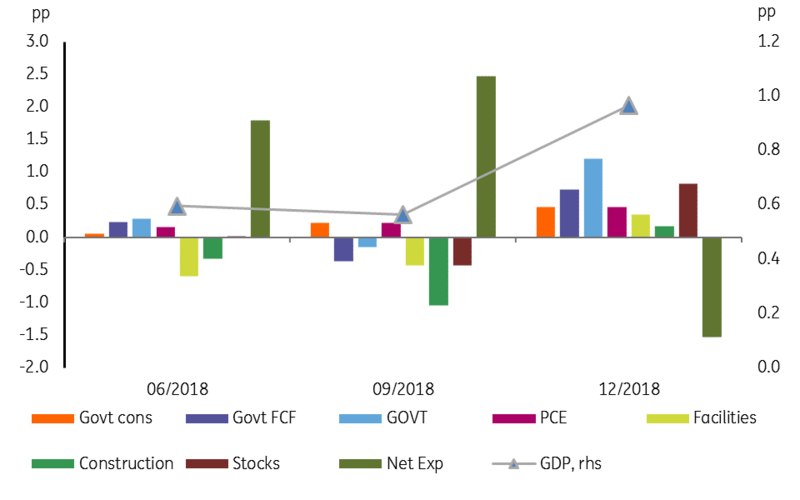 And even with some trimming of our end-of-year 2019 quarterly growth profile, we will still need to revise our full year 2019 GDP forecast from 1.9% to 2.2%. If numbers are all you care about, then this is job done. A further 9.7% expansion in government expenditure in 2019, even with some offsetting tax rises (revenues projected by the Ministry of Finance and Economy to rise 7.6%) should keep growth ticking along in 2019. Financial markets tend to be forward-looking. So as well as the size of today's figures, analysts will be trying to see where future growth will come from. And here the story is less positive. Government consumption and government fixed capital formation still, together with stock building, account for much of the 4Q18 growth figure. Private consumption expenditure, facilities investment and construction combined added less to the QoQ growth figure than government consumption and government investment. Stockbuilding was another big contributor to quarterly growth. That is likely to be unwound in 2019. Net exports were a big drag QoQ. That might not turnaround anytime soon. The year on year figures tell a very different story, both on the scale and the nature of the growth in 4Q18. But QoQ figures tell us more about what is happening right now, whilst YoY figures are rooted very much in the past. As such, the quarterly figures tell us far more about what is going to happen in the coming quarters than the annual comparisons. Korea is a world-class economy, but with two of the main drivers of private sector growth in the doldrums (global trade and technology), 2019 will be a tough year for Korea even with considerable government support. Public spending will take the rough edges off the numbers. But the currency will likely have to add a helping hand. The KRW is the second weakest Asian currency year-to-date, lagging only behind the INR. This pattern of underperformance might well continue through the rest of the year, even if ultimately we do expect some recovery on generalized USD weakness in 2H19.